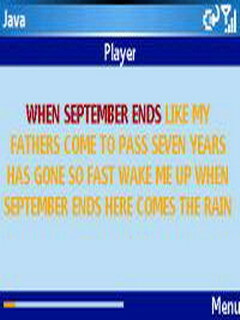 Karaoke Mini is a java based Mobile phone application. It is a karaoke machine for your cell phone! You Can choose from over 100 of your favorite songs, instantly load it on KaraokeMini and sing along! The lyrics show UP right on your phone screen and highlights IN real time when you should be singing. It's just like real karaoke. KaraokeMini is a mini karaoke machine on your cell phone / mobile phone! You download and install this tiny phone application and choose from over 100 karaoke favorites. You can see the lyrics right on your phone screen while you sing along.